GQ Suites Asaba is located at Plot 4, Ogagifo Street, Beside Junior Staff Quarters, Off Summit Road, Asaba, Delta State, Nigeria. It is about 6 minutes from the Delta Broadcasting Service and offers modern facilities with rooms at affordable rates. GQ Suites is located in a serene and natural environment that provides the best place for personal leisure. The stylishly furnished rooms at are categorised into Comfort, Executive, Excellent, Excellent Plus, Royal and Suites. 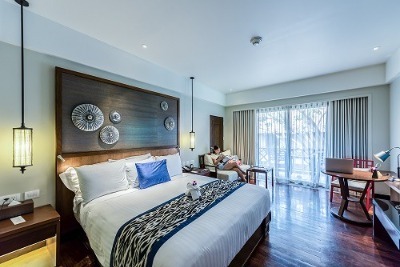 Each room is designed with beautiful wall arts and equipped with full air-conditioning, king-size bed, work table and chair, sofa and an en-suite bathroom. GQ Suites Asaba has 24 hours power supply, free parking space, a gym with expert trainers present to assist guests, an on-site restaurant that serves a variety of meals and a bar where guests can order various alcoholic and non-alcoholic beverages. The premises is guarded round-the-clock by security personnel. Laundry/dry cleaning services, car hire, ironing services, concierge and 24hour room service is made available on request. The nearest airport is the Asaba International Airport which is just a 26minute drive away. Children: All children below 12 are allowed to stay at no extra charge. Q: Does GQ Suites offer free Wi-Fi? A: No free Wi-Fi at this hotel. Q: Does GQ Suites have a swimming pool? Q: Does GQ Suites offer complimentary breakfast? Q: Is there a fitness centre/gym at GQ Suites? What type of equipment are available? A: Yes. A modern gym, with expert trainers, is available at the hotel. Q: Does GQ Suites have a restaurant? A: A restaurant is available at GQ Suites. GQ Suites Asaba is an affordable hotel in Asaba, Delta. The room was very decent, the lighting of the room was nice and the bed was very comfy. The security personnel did a good job in safeguarding both life and property during my stay at the hotel. I had a nice stay at the hotel. I was well received by the staff, the environment was cool and welcoming. The room was well cleaned and the facilities available worked well. No issues at all. Good place. Nine over ten rating! My stay at the hotel was very okay. I encountered no issues at check in and check out. The customer services was on point as the staff were nice and friendly; also very professional in carrying out their duties. The food served was nicely and deliciously made. Power supply was very stable. The facilities there were fully functional and the available for use. No regrets! I had a wonderful stay at the hotel.That hotel has a very nice location. The staff was really efficient and friendly. It's a really comfortable place to lodge at, with their spacious rooms which are cozy and clean as well. Every thing I wanted was properly taken care of I had no cause for complaints during my stay there. I have to say the hotel management is doing okay and should try to keep up the standard so they don't slip up. If I am to rate I will give them 7 out of 10. Have nice pictures of GQ Suites Asaba?